When temps plummet and the overnight snow totals reach into the double digits, the Black Diamond Men’s Zone Shell is ready to deliver premium protection by combining the warmth of PrimaLoft Silver insulation with a reliably waterproof and breathable Gore-Tex shell. 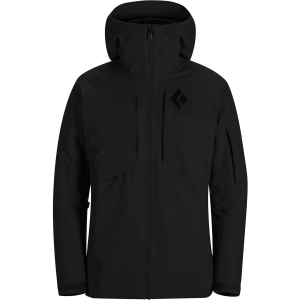 Arguably Black Diamond’s warmest ski jacket, the Zone features integrated Cohaesive cord-management hardware in the hood that provides an equalized, three-way adjustment with a single pull. An independent stand-up collar keeps your neck protected when the hood is down, and an integrated, stowable powder skirt blocks out snow. A range of zippered pockets stash your small necessities, and extended two-way zippered armpit vents make for a quick escape for the buildup of excess heat.